Born on May 9, 1888 to a rich family (his father Henry was a businessman and landowner, and his mother was Countess Paolina de Biancoli) Francesco Baracca studied in his hometown of Lugo, province of Ravenna, to continue in Florence and finally at the Military Academy of Modena in 1907, from which two years later he left as second lieutenant of the Royal Italian Army. In 1912, fascinated by an aerial exercise at the Roma-Centocelle airport, he requested the transfer to aviation, which was then part of the army. He started in a flight school in France with a Nieuport 10. He soon became distinguished by his outstanding performance in acrobatic techniques. In 1914 he was assigned to the 5th Battalion of aviators, to pass shortly after to the 6th Squadron. Just days before WWI started Baracca was sent to Paris where he trained as a fighter pilot in a Nieuport 10. He returned to Italy in July 1915, assigned to the 8th Reconnaissance and Combat Squadron, equipped with Nieuport-Macchi Ni-10. He started doing patrol flights in August with the 2nd squadron. After several dogfights without success, he got a Nieuport 11. His first victory was over Gorizia on April 7, 1916: after several minutes of fighting he shot down an Austrohungarian Hansa-Brandenburg CI exploration aircraft, who received 45 shots and was forced to landing and the crew was taken prisoner. His first victory was also the first of Italian aviation in the war. Upon landing he met one of the two enemy pilots and shook his hand, showing gallantry with the enemy: he often said "it is the machine, not the man that I aim". On May 13, Baracca got another victory. Promoted to Captain in June 1916, he remained in the same squadron. On December 28, he achieved his fifth victory an became an ace. 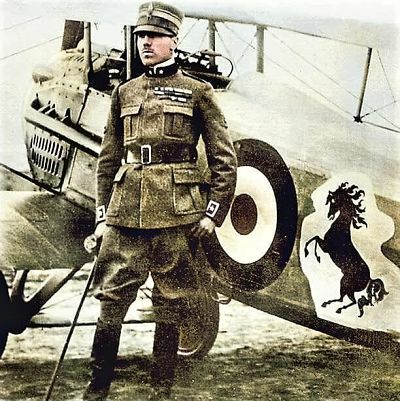 On May 1, 1917, he was transferred to the 91st Squadriglia, composed by the greatest aces of Italian aviation chosen by Baracca himself, such as Ferrucio Ranza, Pier Ruggero Piccio or Fulco Ruffo di Calabria. The unit was equipped with the new Nieuport 17 built in Italy by Macchi. In his aircraft he painted a rampant horse, on which historians can not agree on whether it was red or black, or whether it came from his family coat of arms or from the consideration that aviation had at that time of "air cavalry". In this squadron, of which he was commander, he shot down 26 enemy aircrafts. In September 1917, with 19 enemies shot down, he became the Italian ace with the highest number of victories. That month was promoted to Mayor. He got five more victories in October, with two doubles in two days. When the Austro-Hungarians reinforced by Germans launched the offensive that led to the Italian defeat of Caporetto, the 91st Squadron was equipped with SPAD S-XIII. With this new plane Baracca achieved 30 victories. After an inactive period he returned to action in May 1918, and shortly after his third Medaglia di Argento al Valore Militare became a Gold Medal (the highest Italian decoration) he shot down his last plane, an Albatros D-III with his SPAD S -XIII near San Biagio di Callalta. It was his 34th victory. On June 19, 1918 after a mission, Baracca, returned to his base in Quinto di Treviso with his SPAD S.XIII damaged, so he took off with a SPAD S-VII for the fourth mission of the day. Baracca was shot down in a dogfight with a two-seater Austro-Hungarian plane. The pilot and the observer Max Kauer and Arnold Barwig got the victory, which was initially denied by the Italians for propaganda reasons. After several public and private funerals in which the praise was pronounced by Gabriele D'Annunzio, Francesco Baracca was buried in the family chapel in Lugo. After the war in 1923, Baracca’s mother offered to Enzo Ferrari to use the emblem of the rampant horse in his racing cars. It is not clear if Ferrari changed the color to black in mourning for the Italian pilots killed in the war (assuming it was red), although it is clear that he changed the direction in which the tail points and added the yellow background in homage to his birth city, Modena.